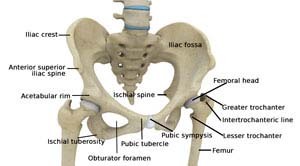 Ischiofemoral ligament: This is a group of strong fibers that arise from the ischium behind the acetabulum and merge with the fibers of the joint capsule. Gluteal: These are the muscles that form the buttocks. There are three muscles (gluteus minimus, gluteus maximus, and gluteus medius) that attach to the back of the pelvis and insert into the greater trochanter of the femur.